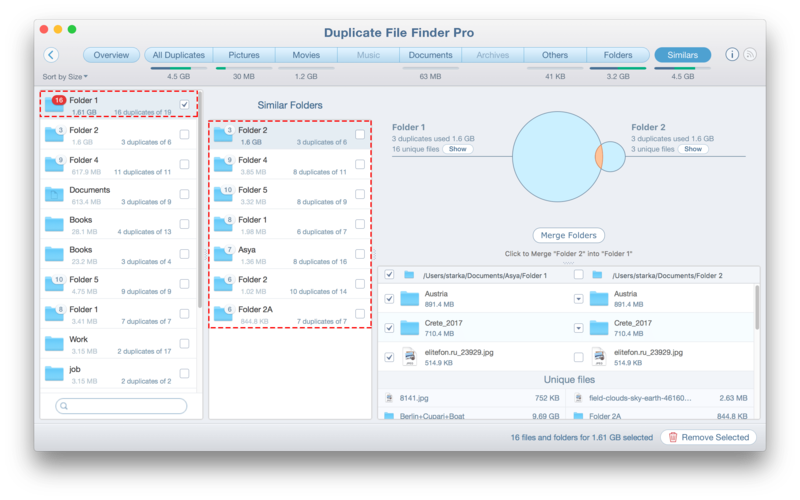 Duplicate File Finder allows you to find not only duplicate files and folders but also Similar folders. Similars are folders that contain both duplicate and unique files. It means that the folders are not totally identical; however, the app will display them. They are presented in a convenient way for you to do a quick comparison and find unneeded copies. It may happen that one folder has several similar folders at the same time. The app shows all these similars in one list, so it’s easy to review them and decide which files to remove and which ones to keep. Under the visual representation you can find both duplicate and unique files being displayed. Note, the app doesn’t let you remove unique files, so you don’t have to worry about them. It is only possible to select twin files. Moreover, when you select the files, a red color circle appears over the current folder icon and shows how many items are selected in it. There is also a gray color sign, which shows how many duplicates are selected in the similar folder.